Ready for the madness? As February dwindles to an end that few are sad to see, in comes March, and with it – a whole lot of basketball. NCAA’s annual national championship tournament is a weeks-long tournament consisting of 64 different teams competing against each other – commonly referred to as March Madness. And with March Madness comes brackets. Brackets are right-angled supports integral to keeping shelves on walls. Jokes. Tournament brackets are a series of matches where the winner of each match advances to play other winners until there is one winner left. Annually, a pretty large percentage of people find themselves in heated bracket battles – betting money, pride, clairvoyance, or simply bragging rights against fellow competitors. I’m no acception. Last year, I picked Oregon to win it all. Things got intense. Why was it so intense? It’s a good question. I’m not at all invested in college basketball. I don’t know any of the players. My alma mater is never in the tournament. On one hand, I couldn’t care less about which teams win. On the other hand, I do care which teams win – the teams I picked to win. I’m fairly certain I’m in the majority with this opinion. People care about brackets. And this is why brackets matter for marketers. Before we jump more into using brackets as marketing content, let’s take a step back for a brief look at how brackets came to be so popular in the first place. According to an article by Slate, one of the first bracket tournaments occurred in 1851 for a chess tournament in London. This method was devised by British chess champion Howard Staunton as an attempt to find the absolute best player. Also in England, the Wimbledon tennis championship has used single-elimination tournaments since its debut in 1877. However, the way we understand brackets today really comes down to American college basketball in the 20th century. Though the NCAA tournament began in 1939 with 8 teams in competition, public interest really didn’t start until 1975 when participants expanded to 32 teams. Now, the communication age has ballooned both the basketball tournament and the bracket phenomena to a serious calendar event where people of all different backgrounds and interests enthusiastically participate. Over 60 millions Americans fill out brackets each year. Students fill out brackets. Professionals fill out brackets. Presidents fill out brackets. Warren Buffett even offers a billion dollar prize to someone who can achieve a perfect bracket. The popularity of the bracket experience is really only rivalled by fantasy football, which has become a multibillion dollar industry in just a few years. It’s safe to say that any type of engaging, interactive experience available around popular events only excites audiences even more. An easy explanation for the commitment to such contests is the gambling aspect often involved, however there’s much more at play with brackets than simply winning or losing money. Matt Beardmore from Psychology Today cites other powerful factors like social interaction, competition, and entertainment/ escapism, which are undeniable given the popularity of non-sports brackets that have surfaced over the past few years. BuzzFeed, of course, has a slew of different brackets that line up cultural elements against one another like the ‘80s vs. ‘90s creating matchups like MTV vs. Ms. Pacman. 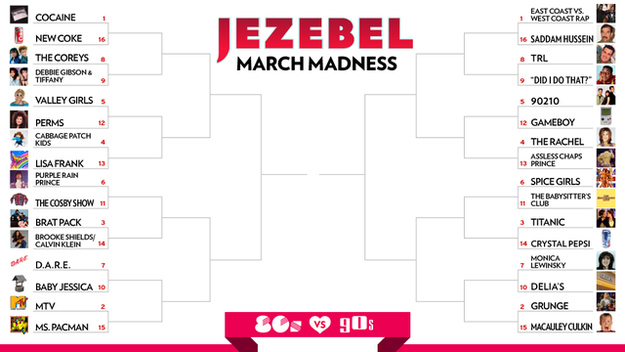 The Wire, an entity of Atlantic Media, ran a “tournament of everything” in 2014 with a different bracket every week in March. One was a championship of American cities. How Can B2B Marketers Use Brackets? With every form of media that draws in participation and excitement, marketers should see opportunity. Brackets can be very powerful multi-touch content campaigns that can boost customer engagement, gain new leads, and spread brand awareness. By creating a piece of content that has progressive steps to it, in this case the advancement of winners that need a new batch of voting every few days or weeks, you have the opportunity to connect other content pieces to that asset. This allows you to extend those pieces’ lives and produce new access points to them. Not every content piece you have will appeal to each user. But since users will be returning, you can try out a variety of links to different subjects. Another option is to pose questions or display “Did you know?” facts within the bracket to learn more about the users and guide them to the right content. The first step to creating a great bracket is knowing your audience. The better you know your target customers – their needs, habits, and interests – the better you’ll strike a chord with them and create strong enthusiasm. As mentioned above, a bracket creates a longer-form narrative with episodic steps that keep people coming back. This means more traffic to your site, more content titles being seen, and, most importantly, more overall engagement. Here’s a snapshot example of a recent bracket put out by Paychex, a payroll and HR solution for small, medium, and enterprise level businesses. This was specifically targeted to their small business audience. Giving your customers a fun activity that relates to their daily work life without taking up much of their time is a great way to both inspire and build loyalty. If you had an enjoyable experience with an organization’s content, wouldn’t you be checking back more frequently to see what they might release next? Demand gen teams will have plenty of use for brackets as they can be powerful lead gainers. By adding a short lead submission form just before the results or standings page, you’ll be able to gain valuable lead data. Better yet, you can score those leads with follow up questions about their interests and professional needs when they come back for next round voting. Connecting the bracket content with your marketing automation system will give you great segmentation and nurture stream information. By promoting a bracket across all your channels, you’ll get your brand in front of a lot of different eyes. Content that is less sales and product-focused and more on the fun side tends to be more inviting to new audiences. Specifically, posting a participatory piece of content on social networks where anyone can cast their vote and voice an opinion can generate a lot shares that more product-focused content can’t get. The fact that the content has legs with different voting stages can generate strong momentum in social threads and keep your name on everyone’s feeds. The best part will be the excitement of your own customers and the effect that will have on both retention and advocacy. Next time you show up at an event or talk to a new prospect and they open with “You guys are the ones with that awesome bracket!” you’ll know you’re on the right track. The savvy marketing team at Heavy Construction Systems Specialists (HCSS) launched a huge bracket contest called The Most Interesting Project in early 2015 to staggering results. Looking for a way to create more engaging content and grow their inbound program without outsourcing or using development resources, HCSS wanted to leverage their project success stories like bridges, light rails, and tunnels in a creative way to add a little flavor to heavy construction software. The marketing team gathered project submissions from across their customer base using a simple contest built in the SnapApp platform, then organized the projects in two brackets. The team was overwhelmed to receive 117 unique projects from 87 companies in the U.S. and Canada. HCSS offered incentives for submitting projects as well as for getting the most votes in the bracket, engaging their customers’ competitive streak and driving 292,000 votes from around the world. Traffic to the bracket increased HCSS’ overall web visitors by 800%, setting a new benchmark for the web team. A few days after they launched the contest, the marketing team heard from Sales that a call had just come in from someone who saw the bracket and wanted to learn more about HCSS software. Within two weeks, that lead had closed into a new account that paid for the entire MIP campaign. Not only was that amazing from an ROI perspective, the sales cycle is normally anywhere from 6 to 12 months. Creating interactive content that hits on the interests of your audience and invites them to participate can create powerful lead gen and engagement results. Tapping into huge pop culture events gives your content greater amplification. The continuing rise of March Madness is the perfect opportunity for a seasonal event campaign to really connect with your audience. This post has been updated from the original published on 02/24/16.